Debt wasn’t really a problem for us. Or so I thought. In fact, I would’ve almost considered ourselves not to actually have debt because we could afford the payments every month. Since we weren’t living paycheck to paycheck, debt wasn’t a problem to me. At least until I saw this. These were “wise” debts in my opinion. I felt good because we didn’t have any credit card debt. But that was nothing to rejoice over. I emailed Robert and ended it with a simple. I took this to be a challenge. How could we pay off debt, and when would we be free? By my records, it was going to take yeeeeears!!! That was even more depressing. Then I got into the numbers of this one student loan we had. It was over $80,000. (Remember, this is $80,000 of $184,400…insert sigh of sadness here.) Graduate school. A pretty penny. I opened the account online and scanned through a list of numbers. It happened. I went all “Dave Ramsey” on my computer! That’s when the “colorful buttons” started flying onto my emails, texts, paper!! You name it…I was mad!! I was furious!!! Every month for the past few years we were faithful. So faithful! We paid $400 a month; every month, to this one (of many) debts. Then I realized something was wrong with the numbers. $40 = went to the Principal (you know, the actual amount we owed) That’s only 10%! Talk about a BACKWARDS tithe! Could be known as our personal “curse”… Kind of interesting, huh? $360 of our hard earned money was going down the drain! It was making someone else rich!! That’s wasted hours Robert is away from the family. That’s money we couldn’t give away to bless someone else. And there you have it. Doesn’t that make you mad too??!! Maybe my numbers don’t make you mad but go ahead and look at your own payments and loans, and get mad for yourself. Get mad with me!!! We can get righteously angry. You know, like Jesus flippin over the tables in the temple. Let’s get a bit upset about this epidemic. Debt. Let’s get mad. We are being robbed! And it’s socially “normal”. This makes me MAD, for ME, for YOU, for US! What If We Got Mad Together?! 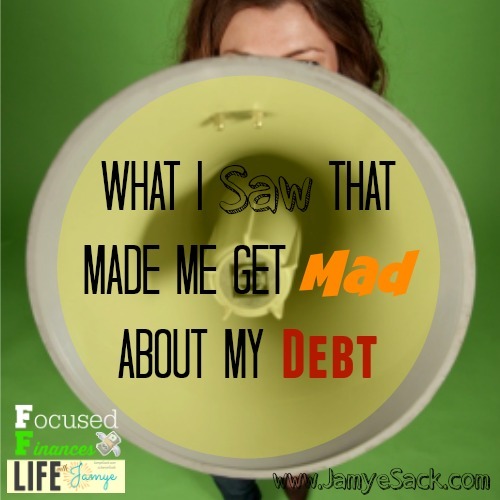 What if we got so mad that it propelled us all to get out of debt?! What if we were debt free?! That’s $360 that can go to orphans, the homeless, the widows, families in need!!! You name it, we can do it!!! Wow…my keyboard is wondering why the abuse. Whew… I love you all more than you know! Let’s get free! Need a little 3 minute story of one way we got out of debt? Enjoy the story! Have you heard about my 50th wedding anniversary (in 40 years)?! If not, you’ve got to hear it! 😉 What’s your 50th going to look like?! About getting out of debt and into wealth. About wealth, according to the Bible.